How Long Do Your Pumpkins Last? ≈ Comments Off on How Long Do Your Pumpkins Last? We have just made it through the festive holidays and I should be looking onward to Valentine’s Day projects but I had to smile today when I saw these pumpkins. What I really want to know is what kind of different things do you do with your pumpkins? If you like, please share in the comments field below. Here in the South, I know I refer to my location quite a bit, but I am a Southern Girl so it just comes naturally; fall pumpkins are usually planted in mid to late summer and mature for harvesting within about 120 days. These are the pumpkins that pop up on road side stands, in church lawns and parking lots. Local ‘Pumpkin Patches’ such as Lewis Farm and Lineberger’s Maple Springs Farm both local to this region offer a multitude and large variety of pumpkins to choose from. A pumpkin is no longer just a pumpkin – it can be anything you want to make it. All shapes and sizes, regardless of the purpose for the pumpkin you go in search of you are bound to find just the right one. They are now grown small, large and extra-large; lumpy-bumpy, smooth and ribbed; available in white, orange, green and multicolored; as tall and thin as a ghost or just short and squatty. Pumpkins can be etched, painted,carved or left whole, the possibilities are endless. The word pumpkin is mostly symbolic with October and Halloween and has a number of Fall related uses. Whether you plan to use your pumpkin as party centerpieces, fall festivals and school projects or front step jack-o-lanterns many decorative ideas can be easily found on Pinterest or Martha Stewart and you are sure to find more than one that meets the specific criteria for your decorating needs, tastes and desires. If left whole and intact (uncarved) a pumpkin can last months longer than the jack-o-lantern. We once purchased pumpkins for Halloween but never got around to actually carving their faces. They were inside away from insects and the weather so were climate controlled. These pumpkins lasted so long that I had to come up with an idea of something to do with them. It was March following Halloween that we decided to have a pumpkin-shoot and use them for target practice. The children (with constant supervision) gathered their BB guns, BB pistols, their bows and arrows and we had a grand time of it that cool March day in the back yard. We usually end up buying our pumpkins to carve relatively close to trick or treat day because we have so many squirrels. Our tree-dwelling friends love our carved pumpkins and eat them to the point that the carefully carved design is almost unrecognizable. On the way home today I passed a neighborhood house whose people had painted their October pumpkins. There were originally three, festively painted and stacked out by their lamppost. 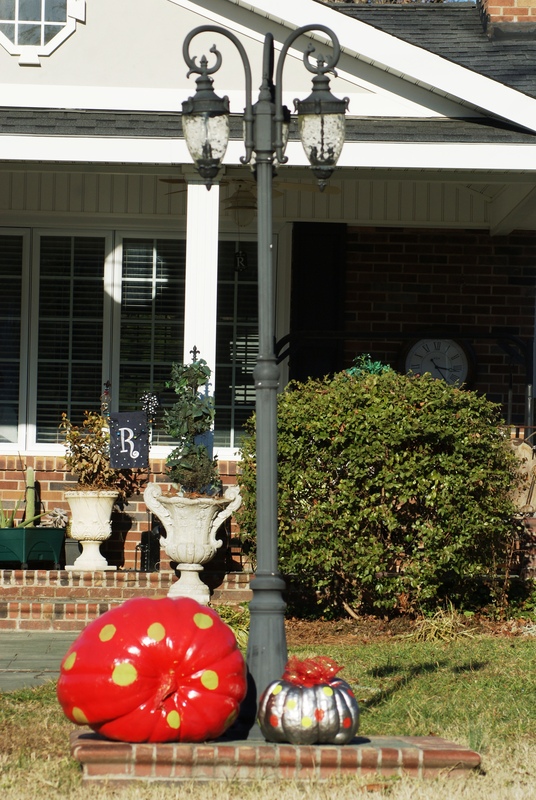 I never got around to photographing them for Halloween but no worries as two of the pumpkins are still there all painted for the Christmas season. I will wait to see if these same pumpkins appear with hearts for Saint Valentine’s Day!